This six-part online training series provides an essential foundation for understanding the design, installation, and analysis of fire sprinkler systems through the use of the 2019 edition of NFPA® 13, Standard for the Installation of Sprinkler Systems. 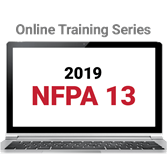 Up to date with the 2019 edition of NFPA 13, interactive online training introduces students to the basic principles of the components, application, design, installation, and use of automatic sprinkler systems. This series covers the components of wet, dry, preaction, and deluge sprinkler systems as well as the related NFPA 13 requirements for a system that will successfully achieve a facility's life safety, property protection, mission continuity, heritage preservation, and/or environmental fire safety objectives. Identify the scope and purpose of NFPA 13. Apply the sprinkler decision-making process. Explain the requirements for water supplies and underground piping. Determine the appropriate system type. Locate and apply system component requirements. Apply installation requirements for sprinkler systems. Select and apply design approaches and calculations. Anyone whose job involves designing, reviewing, evaluating, or installing water-based fire protection systems, including: designers, installers, engineers, electrical contractors, technicians, project managers, fire marshals, insurers, and architects. Complete this course series and qualify for 0.6 CEUs. Completion of each individual module qualifies you for 0.1 CEU. Upon successful completion of a module or the full course series, participants will be prompted to download the CEU certificate directly from the course site. Get an online introduction to the scope and purpose of the 2019 edition of NFPA 13, Standard for the Installation of Sprinkler Systems. This module begins with an overview of the lessons and instructions on how to navigate NFPA 13 Online Training. After that, you will be given a general understanding of the scope and purpose of NFPA 13, as well as how the standard is organized. This online module also introduces you to the different occupancy hazard classification analysis. Then, it's time for some hands-on practice in identifying the hazards present in “real world” structures and occupancies. Differentiate between the different types of hazards. Anyone whose job involves designing, reviewing, evaluating, or installing water-based fire protection systems, including: designers, installers, engineers, electrical contractors, technicians, project managers, fire marshals, and architects. Complete this 1-hour module and qualify for 0.1 CEU. Upon successful completion of a module, participants will be prompted to download the CEU certificate directly from the course site. The lessons in this self-guided online training, Water Supplies and Undergound Piping -- based on the 2019 edition off NFPA 13, Standard for the Installation of Sprinkler Systems -- provide you with a greater understanding of the importance of water supplies in successful sprinkler system operation as well as water supply analysis. Differentiate between types of water supplies. The lessons in this self-guided online training, System Basics and Design -- based on the 2019 edition of NFPA 13, Standard for the Installation of Sprinkler Systems -- provide you with an understanding of the different types of sprinkler systems. This module presents an overview of the operation and application for wet, dry, preaction, and deluge sprinkler systems. Finally, you'll learn about the four major considerations that are used to decide what type of system is best. Identify the four most commonly used system types. Determine the appropriate system types. The lessons in this self-guided online training, System Components -- based on the 2019 edition of NFPA 13, Standard for the Installation of Sprinkler Systems -- provide you with a greater understanding of the considerations that must be made when selecting components for a sprinkler system. This module outlines the characteristics of sprinklers, valves, and devices, and explains the various types of components installed in different sprinkler systems. Identify the different sprinkler types. The lessons in this self-guided online training, Fire Sprinkler Installation Requirements -- based on the 2019 edition of NFPA 13, Standard for the Installation of Sprinkler Systems -- address requirements for sprinkler system installations, including system hanging and support as well as seismic protection for sprinkler systems. In this module you will determine the occupancy classification for non-storage areas and the commodity classification for storage occupancies while also locating and applying the sprinkler installation requirements for a given scenario. Determine the non-storage occupancy area. The lessons in this self-guided online training Fire Sprinkler Locations, System Design Approaches and Calculations -- based on the 2019 edition of NFPA 13, Standard for the Installation of Sprinkler Systems -- provide you with a greater knowledge of selecting and applying design approaches and calculations. You'll learn about the basic requirements that apply to sprinkler systems, including how to locate sprinklers and the protection area limitations for different ceiling and construction configurations, such as exterior projections, cloud ceilings, and concealed spaces. These lessons also cover basic hydraulic principles such as remote areas, elevation pressures, equivalent lengths, and friction loss concerns. Describe factors affecting friction loss related to the Hazen–Williams formula.